With the fertilizer application season approaching, it is once again time for producers to make decisions as to what their fertility programs will be. Soon many fertilizer-application rigs will be in the fields, spreading great quantities of fertilizer. Because the use of fertilizer has become such an integral part of modern farming, we rarely give any thought as to where it comes from, how long it has been used and what impact it has had on our food production. With our current ability to test our soils nutrient levels and then convert those soil test results into reliable application recommendations, farmers’ biggest concern regarding fertilizer use is cost, how much is needed and then which fertilizer formulation to apply. This has not always been the case. 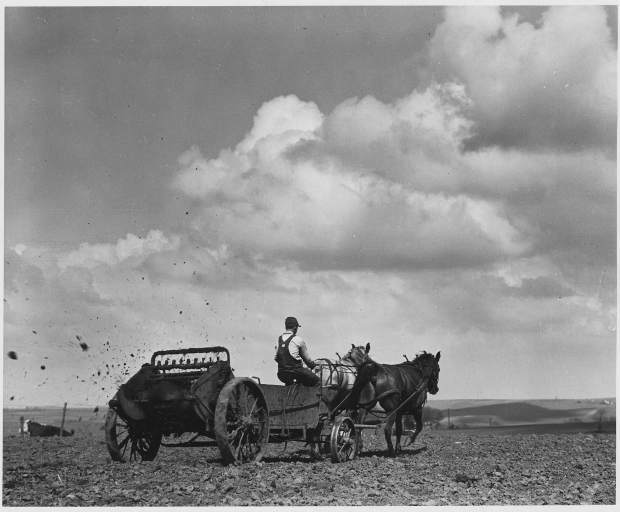 Current fertilizer practices are relatively recent events that date back to just the last half of the 20th century; however, traditional fertilizer practices are much older. Although it was previously thought that the concept of fertilizer use may have only dated back 2,000 to 3,000 years, it is now believed that early farmers were using manure to fertilize their crops as long as 8,000 years ago. A team led by Amy Bogaard, an archaeobotanist at the University of Oxford, decided to look for evidence of earlier fertilizer use. In ancient times, manure would have been the most logical fertilizer to use and, due to the fact that manure has a higher than normal concentration of the rare nitrogen-15 isotope (N-15), the team noted that recent research showed that plants treated with manure have more N-15. The researchers collected ancient samples of cereals such as wheat and barley, as well as pulses such as peas and lentils, from 13 early farming sites across Europe that dated from 4,400 years to 7,900 years ago. They analyzed more than 2,500 individual cereal grains and pulse seeds, from which it was concluded that the N-15 levels were higher than normal and consistent with the use of manure for fertilizer. So how did farmers thousands of years ago realize that manure could increase their yields? The researchers concluded that early farmers probably first noticed enhanced crop growth in areas of natural dung accumulation where animals gathered. These areas of high fertility would have been obvious to subsistence farmers who saw differences in productivity between their small plots. The researchers also surmised that cropping and herding developed at the same time and were integral from the start. Later the Babylonians, Egyptians, Romans and early Germans all are recorded as having used minerals or manure to increase yields on their farms. However, the predominant source of fertilizer for the next few thousand years was manure.